Sometimes math pops up in places when you aren’t even looking for it. This week I’d like to share three websites that I enjoy. What they have in common is that they all cover a wide range of subjects—astronomy, politics, pop culture—but also host some great math if you know where to look for it. First up is a site called Nautilus. In their own words, “We are here to tell you about science and its endless connections to our lives.” Each month they publish articles around a theme. This month’s theme is “Heroes.” Included in Nautilus’s mission is discussing mathematics, and you can find their math articles on this page. Here are a few articles to get you started. Read about how Penrose tiles have made the leap from nonrepeating abstraction to the real world—including to kitchen items. 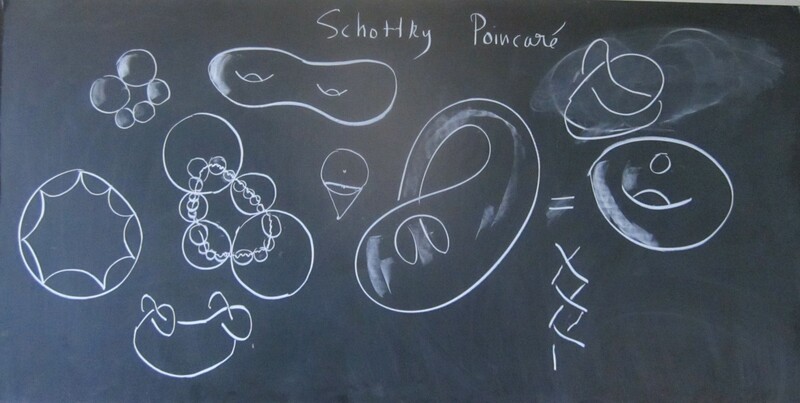 Learn about one of math’s beautiful monsters and how it shook the foundations of calculus. Or you might be interested in learning about how a mathematician is using computers to change the way we write proofs. Next, you might think that, since the presidential election is now over, you won’t be heading to Nate Silver’s FiveThirtyEight quite as often. But do you know about the site’s column called The Riddler? Each week Oliver Roeder shares two puzzles, the newer Riddler Express and the Riddler Classic. Readers can send in their solutions, and some get featured on the website—that could be you! Here are a couple of puzzles to get you started, and you can also check out the full archive. The Puzzle of the Lonesome King asks about the chances that someone will win a prince-or-princess-for-a-day competition. Can You Win This Hot New Game Show? asks you to come up with a winning strategy for a round of Highest Number Wins. And Solve The Puzzle, Stop The Alien Invasion is just what is says on the tin. The third site I’d like to point you to is Brain Pickings. It’s a wide-ranging buffet of short articles on all kinds of topics, written and curated by Maria Popova. If you search Brain Pickings for math, all kinds of great stuff will pop up. You can read about John Conway, Paul Erdős, Margaret Wertheim, Blaise Pascal, and more. You’ll find book recommendations, videos, history, and artwork galore. I particularly want to highlight Maria’s article about the trailblazing African American women who helped to put a man on the moon. Their story is told in the book Hidden Figures by Margot Lee Shetterly, and the feature film by the same name is coming soon to a theater near you! I hope you find lots to dig into on these sites. Bon appetit! Welcome to this week’s Math Munch! And, if you’re a student or teacher, welcome to a new school year! One of the most exciting events in the world of math happened this August– the awarding of the Fields Medal! This award honors young mathematicians who have already done awesome mathematical work and who show great promise for the future. It also only happens every four years, at the beginning of an important math conference called the International Congress of Mathematicians, so it’s a very special occasion when it does! This year’s award was even more special than usual, though. Not only were there four winners (more than the usual two or three), but one of the winners was a woman! Now, if you’re like me, you probably heard about the Fields Medal and thought, “There’s no way I’ll understand the math that these Field Medalists do.” But this couldn’t be more wrong! Thanks to these great articles from Quanta Magazine, you can learn a lot about the super-interesting math that the Fields Medalists study– and why they study it. One thing you’ll immediately notice is that each Fields Medalist has non-math interests that inspire their mathematical work. Take Manjul, for instance. When he was a kid, his grandfather introduced him to Sanskrit poetry. He was fascinated by the patterns in the rhythms of the poems, and the number patterns that he found inspired him to study the mathematics of number patterns– number theory! But, don’t just take my word for it– you can read all about Manjul and the others in these great articles! And did I mention that they come with videos about each mathematician? 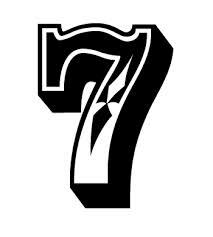 Why do you like your favorite number? People gave Alex all kinds of different reasons. One woman said about 3, her favorite number, “3 wishes. On the count of 3. 3 little pigs… great triumvirates!” Alex made these questions the topic of the first chapter of his new book, The Grapes of Math. (Get the reference?) In this book, Alex shares many curious ways that math appears in our world. Did you know that a weird pattern in numbers can be used to catch criminals? Or that the Game of Life, a simple computer program, shares surprisingly many characteristics with real life? These are only a few of the hundreds of topics Alex covers in his book. Whether you’re a math whiz or a newbie, you’ll learn something new on every page. Alex currently writes about math for The Guardian in a blog called, “Alex’s Adventures in Numberland”— but he also loves and writes about soccer (or futbol, as it’s called in his native Brazil)! He even wrote a few articles for his blog about math and soccer. Do you have any questions for Alex? (About math, soccer, or their intersection?) Write them here and you might find them featured in our interview with Alex! Good writing about math is hard to find. If you’ve ever picked up a standard math textbook, you’ll know what I mean. But reading something fascinating, that grabs your interest from the first page and leads you through the most complex ideas like they’re as natural as anything you’ve observed, is a great way to learn. The Grapes of Math and “Alex’s Adventures in Numberland” do just that. Give them a go! I like finding new ways of organizing information. That’s part of why I enjoy this Periodic Table of Mathematicians. The letters in the table are the abbreviations of the chemical elements—like gold, helium, and iron—that are found on the usual periodic table. With a little creativity, they can also be abbreviations for the names of a bunch of celebrated mathematicians. Clicking on a square brings up the mathematician’s biography. I like guessing who might pop up! The table was created by Erich Friedman, a mathematician who works at Stetson University in Florida. We’ve previously shared Erich’s holiday puzzles (here) and weight puzzles (here) and monthly research contest (here), but there’s even more to explore on his site. I’m partial to his Packing Center, which shows the best ways that have been found to pack shapes inside of other shapes. You might also enjoy his extensive listing of What’s Special About This Number?—a project in the same spirit as Tanya Khovanova’s Number Gossip. A dense packing of 26 squares within a square that Erich discovered. I wonder what a multiplicative persistence is? Next up, another Erik—Erik Demaine, whose work we’ve also often featured. What does he have for us this time? Some fantastic uncurling linkages, that’s what! In 2000, Erik worked with Robert Connelly and Günter Rote to show that any wound-up 2D shape made of hinged sticks can be unwound without breaking, crossing, or lifting out of the plane. In the end, the shape must be convex, so that it doesn’t have any dents in it. For a while Erik and his colleagues thought that some linkages might be “locked” and unwinding some of the examples they created took months. You can find some great animations shared on the webpage that describes their result that locked linkages don’t in fact exist. One thing that amazes me about Erik’s mathematical work is how young the problems are that he works on and solves. You might think a problem that can be put in terms of such simple ideas would have been around for a while, but in fact this problem of unwinding linkages was first posed only in the 1970s! It just goes to show that there are new simple math problems just waiting to be invented all the time. Finally, I was so glad to run across this short film called Dance Squared. It was made by René Jodoin, a Canadian director and producer. Check out how much René expresses with just a simple square! There’s a wonderful celebration of René titled When I Grow Up I Want To Be René Jodoin—written back in 2000 when René was “only” 80 years old. Now here’s 92! Making math is for people of all ages. You might also enjoy watching René’s Notes on a Triangle. What does a mathematician look like? What does a mathematician do? Here are a couple of things I ran across recently that give a window into what it’s like to be a professional research mathematician—someone who works on figuring out new math as their job. Gary Davis, who blogs over at Republic of Mathematics, recently posted a short piece that challenges stereotypes about mathematicians. It’s called What does a mathematician look like? Who here is a mathematician? Click through to find out! Gary’s point is that you can’t tell who is or isn’t a mathematician just by looking at them. Mathematicians come from every background and heritage. Gary followed up on this idea in another post where he highlighted some notable mathematicians who are black women. Here’s a website called Black Women in Mathematics that shares some biographies and history. And here’s a link to the Infinite Possibilities Conference, a yearly gathering “designed to promote, educate, encourage and support minority women interested in mathematics and statistics.” Suzanne Weekes, one of the five mathematicians pictured above, was a speaker at this conference in 2010. Richard Tapia, another of the mathematicians above, is featured in the following video. His life story both inspires and delights. And what does this diversity of mathematicians do all day? Well, one thing they do is talk to each other about math! 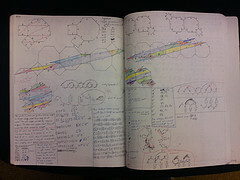 And though there are many new technologies that help people to do and share and collaborate on mathematics (like blogs! 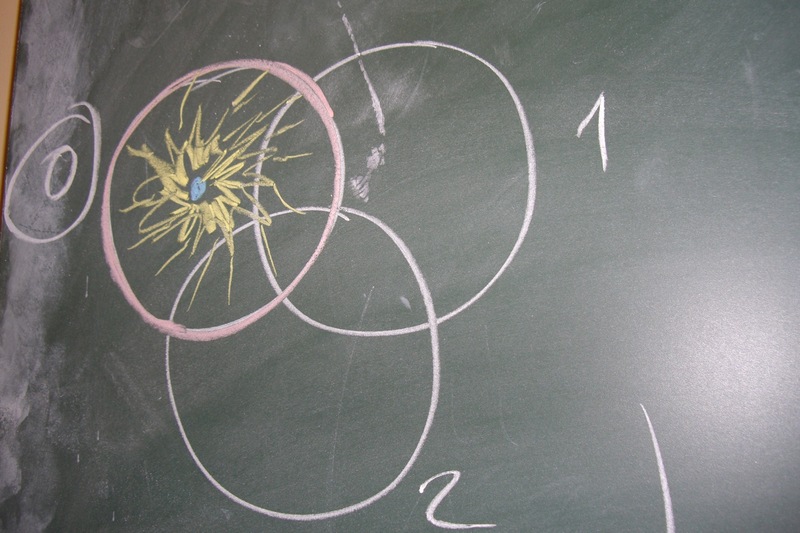 ), it’s hard to beat a handy chalkboard as a scribble pad for sharing ideas. At Blackboard of the Day, Mathieu Rémy and Sylvain Lumbroso share the results of these impromptu math jam sessions. 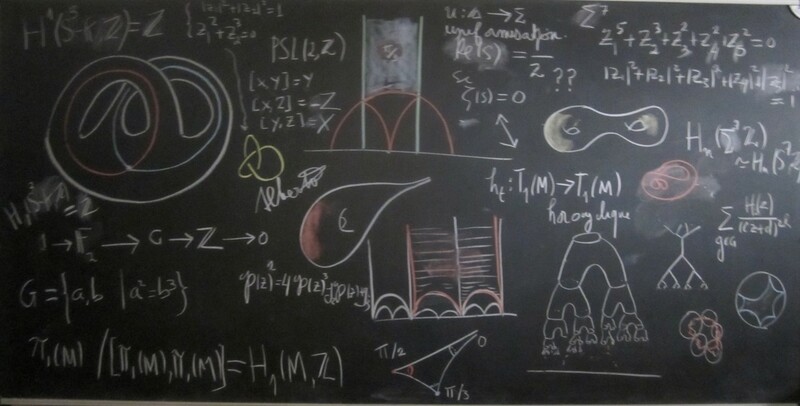 Every day they post a photograph of a blackboard covered in doodles and calculations and sketches of ideas. 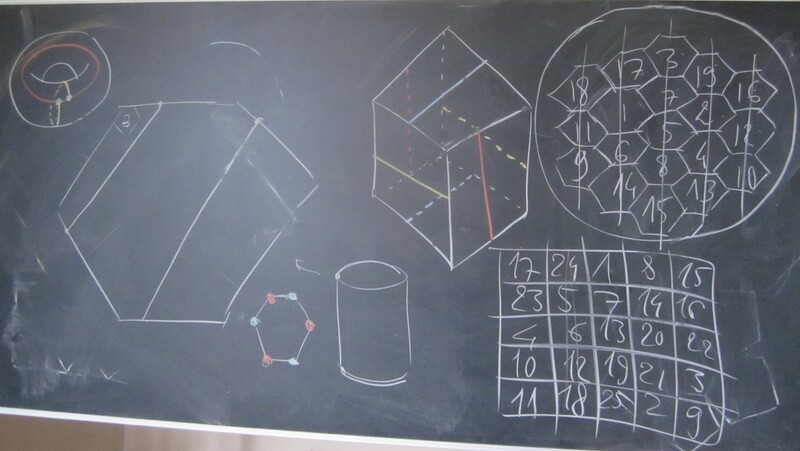 The website is in French, but the mathematical pictures are a universal language. Sharing mathematical ideas can take many forms, and sometimes choosing the right medium can make all the difference. Mathematicians use pictures, words, symbols, sculptures, movies, songs—even dances! Let me point you to the “Dance your Ph.D.” Contest. It’s exactly what it sounds like—people sharing the ideas of their dissertations (their first big piece of original work) through dance. Entries come in from physicists, chemists, biologists, and more. Below you’ll find an entry by Diana Davis, a mathematician who completed her dissertation at Brown University this past spring. Diana often studies regular polgyons and especially ways of “dissecting” them—breaking them up into pieces in interesting ways. 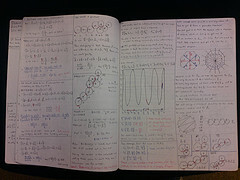 Thanks to The Aperiodical—a great math blog—for sharing Diana’s wonderful video! All kinds of mathematicians study math and share it in so many ways. It’s like a never-ending math buffet!